In our quest for the best palm sander a very promising contender found its way into our shop. Most people would think the larger footprint of the Makita BO3710 is its most striking attribute. What's more promising is the beefy, all-metal base plate the sander sits on. It gives the BO3710 the foundation necessary to challenge for the top spot in the sander category. Let's take a look if the BO3710 indeed outperform them all. 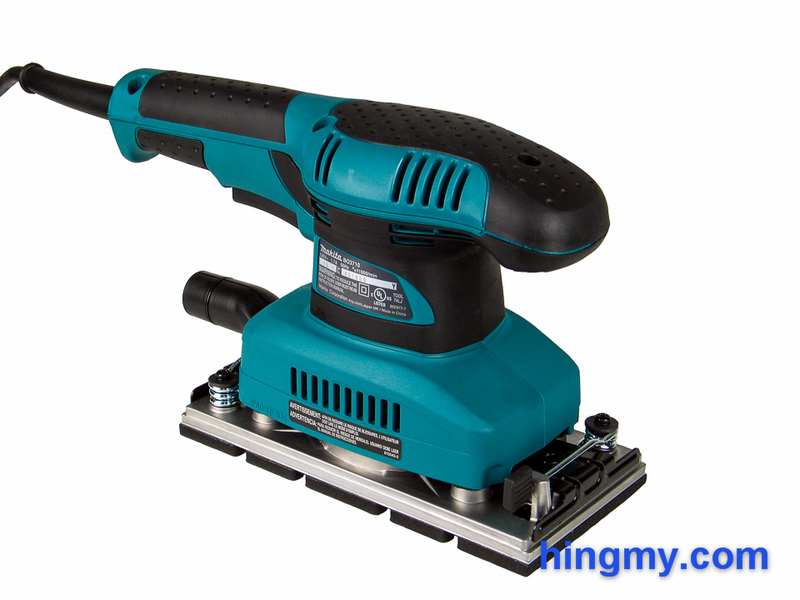 The Makita BO3710 is a 1/3 sheet sander. As such it is larger than most sanders. At the top of the tool there is room for a barrel shaped handle in addition to the tradition knob. The designers clearly intended the sander to be held by the handle most of the time. The large, two-finger trigger necessitates this unless the trigger lock is engaged. For anyone who likes to hold their sander from above, the BO3710 retains the knob. 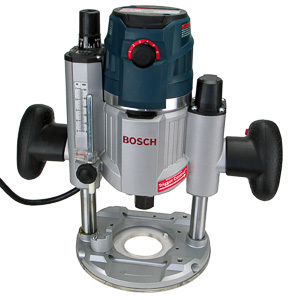 The BO3710 is a single speed sander. The motor is sized as to power the large pad through finish sanding operations. For rapid stock removal there are better options out there. The missing variable speed can be a problem for delicate work. The sander's default speed, however, strikes a good balance most of the time. The large base plate makes up of what the motor can't do with raw power. The BO3710 will complete most work faster than any 1/4 sheet sander. 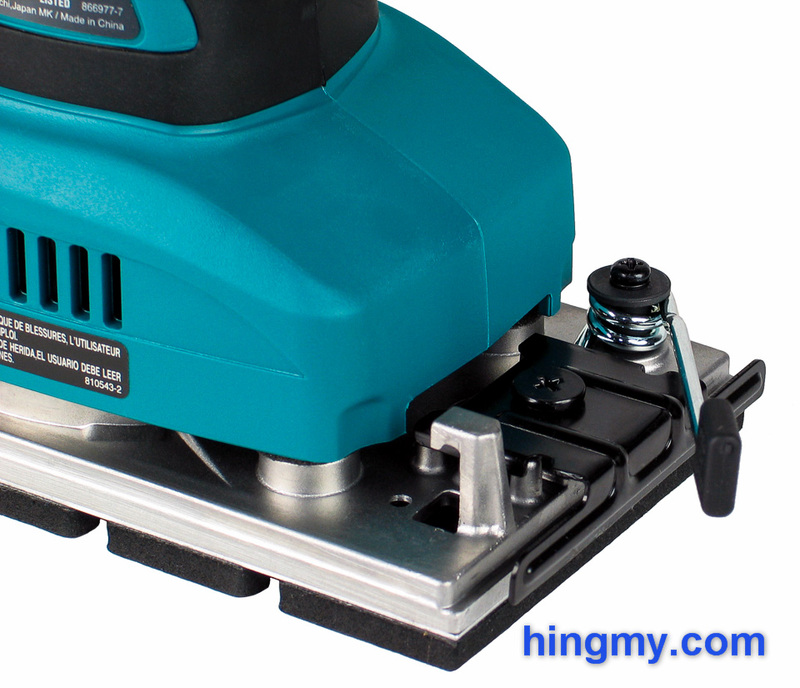 The base plate of the sander is manufactured in a single cast. It is ticker and stronger than the base plates of most sanders. Heavy webbing adds even more rigidity. This design choice gives the BO3710 an incredibly sturdy base that affects almost all the other properties of the sander. For starters the sander's durability is well above the pack. Metal simply outlast the plastic other manufacturers use on their sanders. 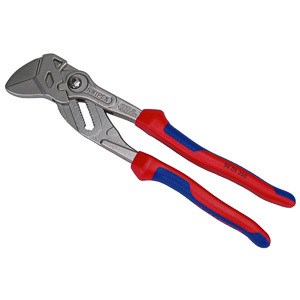 The BO3710 does not use the traditional wire clamps almost all other sanders use to secure the sand paper. The levers on this sander connect to a metal plate that grabs and locks the sand paper in place. The holding power of this system is comparable to that of the wire based design. Makita's engineers score points with wider opening jaws that make it easier to insert the paper, and an all-metal design. The hook the actuator arm hooks into to lock the jaw down underscores this assertion. The hook is a part of the casting that forms base. It's unlikely to break under any circumstances. The dust collection mechanism of the BO3710 is a significant improvement compared to the all 1/4 sheet sanders. The thick metal base hides internal air ways that funnel the dust collected by the 8 holes in the sub base to the filter bag in the rear of the tool. These air ways are ~10x bigger than they are on the smaller sanders, which have no room from them in their thin base plates. This design makes the BO3710's dust collection system a star. Unfortunately all that air still has to be moved. The BO3710's motor does it's best, but the tool fails to collect all dust. Dust collection performance is still better than on any 1/4 sheet sander we have tested, but the BO3710 cannot reach the level of performance a dedicated dust collector provides. The cloth bag included in the kit does little more than check off a necessary item on the product description. When the bag is attached to the sander it does filter the air and trap dust, but it does none of these things well. Super fine dust passes through the walls of bag. The heavy stuff accumulates until it is time to empty the bag. The zipper does not make this process easy. A plastic bar in the top of the bag ensure ithe bag stays off the ground and attached to the tool as it fills up. This bar is sturdier than the one found in most other bags. Overall dust collection with the bag attached is good. The sander picks up the bulk of the dust produced by the sander and deposits it in the bag where it belongs. Some dust still gets airborne and distributed in the work area. The B03710 is by no means a dust-less machine. With a collector attached to the tool the BO3710 turns into a dust magnet. 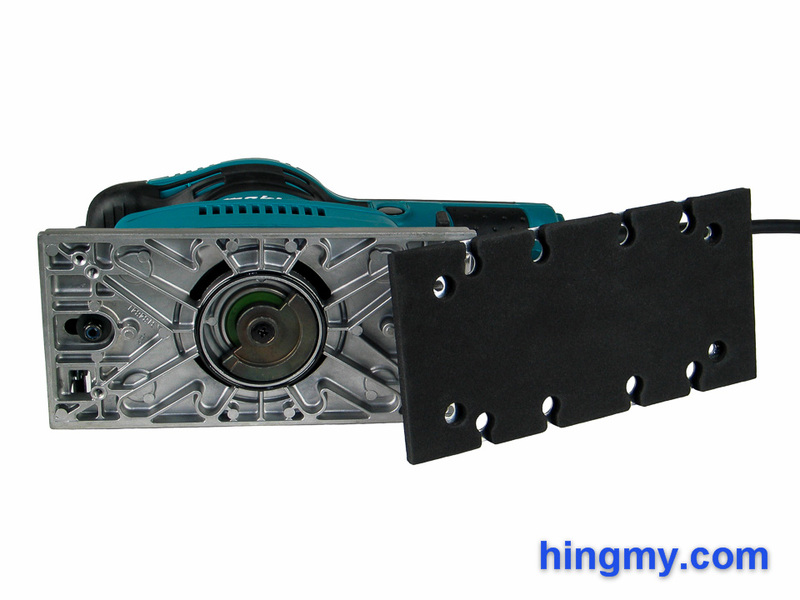 There is so much airflow through the base plate the tool can be used as a vacuum cleaner. The tool leaves no dust behind during operation. It performs as close to perfect as is probably possible. Unless you remember to purchase an adapter that fits onto both your shop vac hose and the BO3710's dust port, you might not get to see the sander perform this impressive trick. 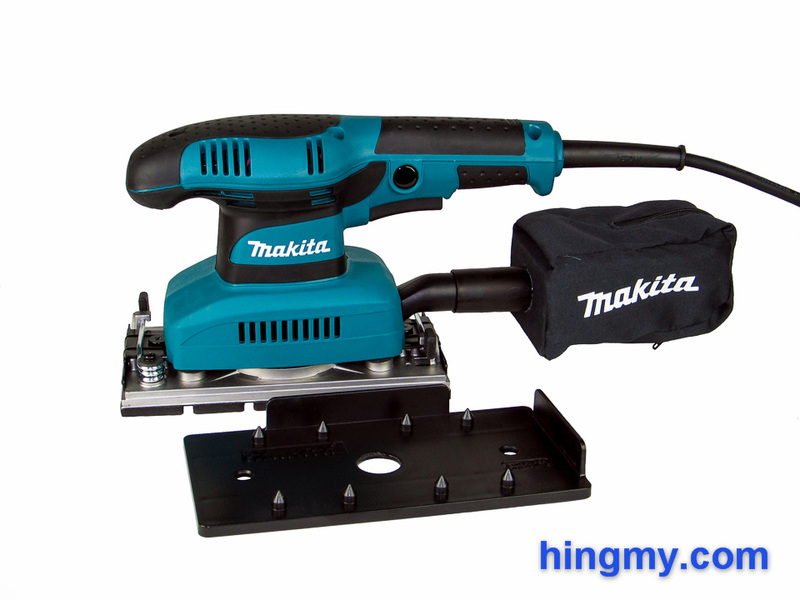 Makita does not include the adapter in the kit. Sanding performance is outstanding. The BO3710 can be thought of as a standard sander with a slightly larger base plate. Any increase in performance is due to the larger surface area, and not because of any other property of the tool. In a speed test the BO3710 outperforms all smaller palm sanders we have had in our test. 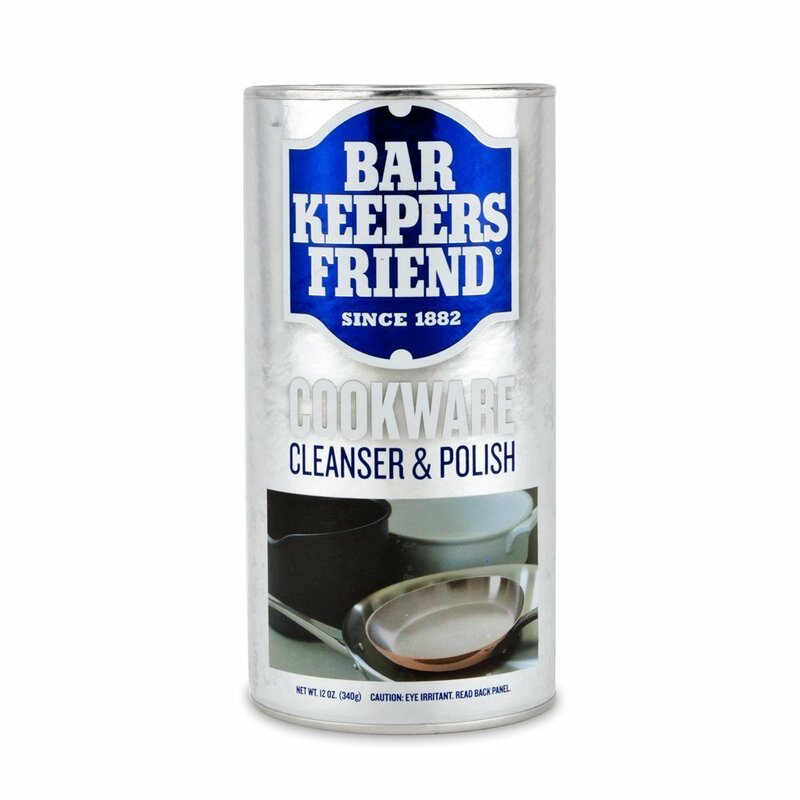 It is a pleasure to use on casework. The handle makes it easy to guide the sander over the large, unobstructed panels that are so common when building cabinets. 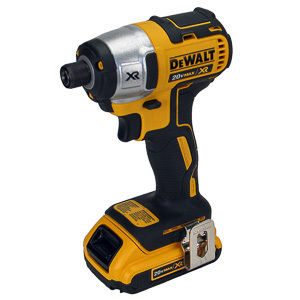 In this scenario the BO3710 is a tool that gets the job done faster. Vibration isolation is non-existent, but not an issue most of the time. Like most sanders the BO3710 directly couples the motor to the sanding plate without any vibration isolation. 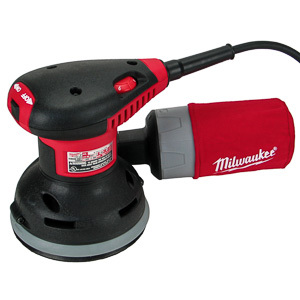 If the surface is hard enough to let the sander glide during the sanding operation, the tool produces no vibrations. If you are sanding a surface that grabs the sandpaper even a little, the motor housing and handle start to vibrate. So much so that your hand will hurt after putting the sander down. Sanders with active vibration isolation do better here. The limitations of the BO3710 all come from its size. It is by no means a substitute for a 1/4 sheet sander. It's not nearly as maneuverable. The handle protrudes beyond the base plate in the rear of the machine necessitating that the front of the tool is used to sand into corners. The base plate again shows it's muscle by providing a dead flat, stable surface for the sand paper below. The entire area below the plate stay in contact with the work piece at all times. Pressure is distributed evenly to every corner, even under heavy load. All this adds up to flat, even surfaces when the sanding is done. The BO3710 produces some of the best corners we have ever seen. 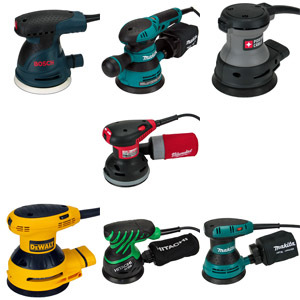 Going beyond the basic 1/4 sheet sander there are only a few models to choose from. Most make a corresponding leap into the premium market along with the hefty price increase that comes with such a move. 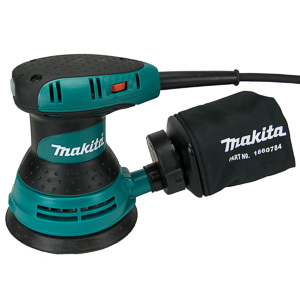 The Makita BO3710 sticks closer to the small sander market. It provides solid quality and performance at an affordable price. The BO3710 is a strikingly good sander at an even more stunning price. It is better built than almost all 1/4 sheet sanders on the market. The large 1/3 sheet sanding pad give the BO3710 a leg up in the sanding speed test. Large areas get sanded faster with this tool. Dust collection is simply excellent. The BO3710 is not without its flaws. It can feel a little under-motorized, if aggressive sanding is what you need. The same large footprint that helps it cover large surfaces quickly make it hard to handle when working in tight spaces. The missing variable speed motor would have made the sander more versatile. Being only slightly more expensive than a mid range 1/4 sheet sander, the BO3710 is a great buy. 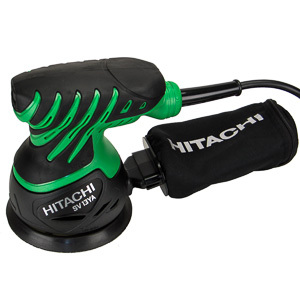 Even if you already have a palm sander, the BO3710 can help with the large work in your shop. For what it costs, it provides a tremendous value in time saved alone. For many the Makita BO3710 strikes the best balance between price and performance in the large sander market.